NEWS: Qatar Airways is buying 50 Boeing 777-9Xs in a deal worth $19 billion. Deliveries of the aircraft are expected to start in 2020, and they will replace the current Boeing 777-300ER. Qatar Airways is the new bright young upstart airline operating a Full Service, High Quality hub-and-spoke network, from Doha. Qatar Airways has grown rapidly over the past few years, to now have a fleet of over 134 aircraft - 90 of which are long haul - and which serves routes around the globe. Qatar Airways Reviews are generally favourable in all three classes, mainly thanks to full-service, full-catering philosophy, and the newness of the aircraft: long haul in economy on the 777s Qatar have avoided a very narrow small seat (as flown by Emirates) and instead seat only 9 abreast, like British Airways, but with a 32 inch pitch. Business Class is OK, with flat beds, but in a very conventional 2-2-2 layout: only the newest A380s and B787s have the new Business Class seat, and it is well worth while hunting these out, as they sit 1-2-1 and are angled outwards. 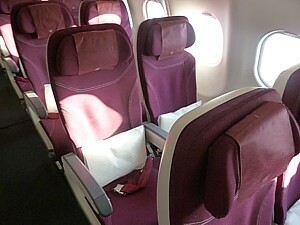 Qatar Airways's seats and cabin. The Qatar Airways' in-flight entertainment system is worthy of note. Called Oryx you'll be pretty much guaranteed a seatback TV with AVOD (AV on demand), even on many of the narrow-body A320s and all Boeing 777s. There is inflight Wifi, and USB charging points. Indeed the only issue is that the film selection can by very bland. 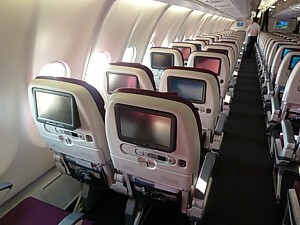 Qatar Airways seatback TV details. 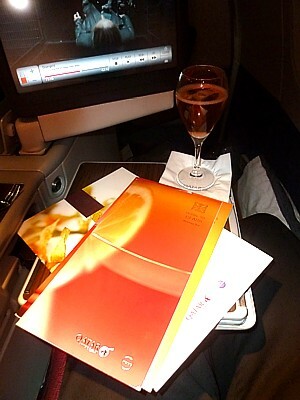 Qatar Airways inflight experience. 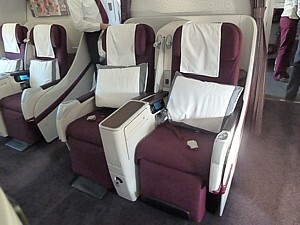 There are just three classes on board - Qatar Airways Premium Economy has been rumoured for many years, but has never been implemented, as it is unpopular in the Gulf States. First Class is being abandoned, except on the new A380 services. Qatar Airways routes & destinations. 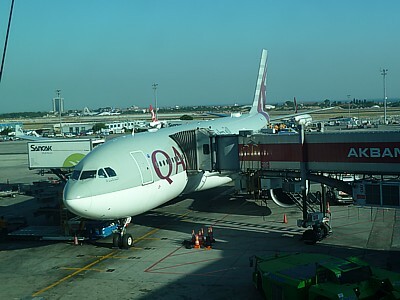 Qatar Airways Reviews are normaly positive, and service on board is good, but somewhat brisk in the economy cabin. In Business Class the service attempts to bring in some elements of First, such as pyjamas, and hence Qatar Airways Business Class reviews treat this as a mixed blessing. Sure, the staff are well trained (all napkins for example are folded in half and laid for you, all drinks are brought from the galley and handed to you with an 'enjoy') but it can seem overly fussy. On short overnight flights when the dinner service goes on for three hours, sometimes you long for the work-a-day service on airlines that don't try quite as hard. Many passengers ask "Is Qatar Airways a dry airline?" No, it's not, however during the month of Ramadan alcohol is banned at the main transit point of Doha's new Hamad Airport (including in the new lounges). It is also less visually available on board, although it is still there if you know to ask for it. Qatar Airways inflight drinks. Qatar Airways make much of their acclaimed 'Five Star' service, and indeed sometimes it can be good. At other times, it can seem pretty lackadaisical, indeed in economy, if you ask for an alcoholic drink quite often the staff will nod at your request, say they'll be back - and half an hour later you have to track them down to the galley to get it. 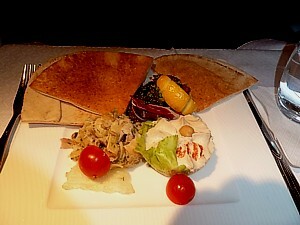 Qatar Airways inflight meals. On the ground, Qatar Airways are either brilliant or annoying, with alarming inconsistency. Check in can be robust, with tight checks on bag weights; however the Business Class lounges are amazing. It's such a shame however that there are only two lounges - at London and Doha - and at both Frequent Fliers are locked out and sent to frankly sub-par lounges. At Doha this is a major problem in transit from two long-haul routes, where the tiny cramp First Class (oneworld Emerald) lounge is decidedly unwelcoming. Other airlines have much better facilities for their most Frequent Flyers. Qatar Airways Business Class Lounges. Qatar Airways inflight experience. There used to be a Premium Terminal, Qatar Airways' dedicated terminal for First and Business Class passengers, at the old Doha airport, but in 2014 - some five years late - Qatar Airways moved to the new Hamad International Airport (HIA), where there is no dedicated terminal. HIA is a great airport, but rather soulless with few facilities. And indeed the Qatar Airways Frequent Flier scheme is no great shakes either: The Qatar Airways' Privilege Club loyalty program is good for earning oneworld status. A quick return from Australia to London nets two-thirds of the flights you need for Gold status. However the miles you earn come with large redemption costs. Qatar aren't really up to oneworld standard either when it comes to recognising other airline's Frequent Flyer cards. The way in which oneworld status passengers are barred from the main lounges is a continual annoyance. In general, then Qatar Airways Reviews come back positive, and flights on Qatar Airways are pretty good. It's an airline that is definately in the world class. However if only it would stop shouting about it's mythical Five Star status, and actually get on the with business of being nice to it's customers while taking them around the planet, it might actually be a nicer experience. Your reviews of Qatar Airways flights.